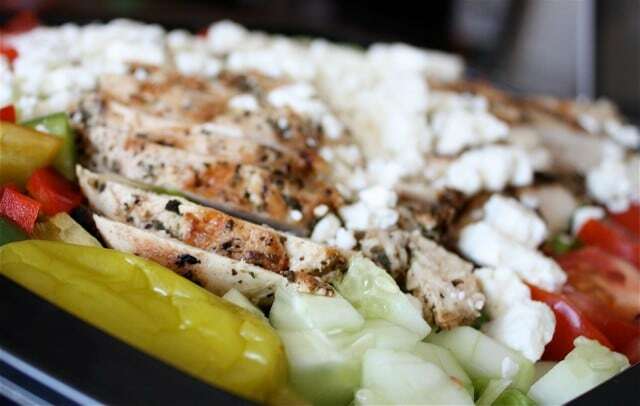 This Greek Grilled Chicken Salad is one of my all time favorite salads. It’s easy to make and is a crowd pleaser, always! For some reason I find myself constantly ordering Greek salads when I go out to eat. I think it started during our Friday night family outings to the local pizza place for a “night out” right after my little girl was born (this tradition, though less frequent, still exists by the way…same place, same night, same waitress, same food ordered…it’s “comfort”). The family would order a nice greasy pepperoni pizza while I tried to be “good” and order a Greek salad with grilled chicken, dressing on the side. My salad came out as my meal and I just tried to ignore the ooey gooey cheesy pizza on the table. I did treat myself with my son’s pizza crust each time as a reward though. And not that I didn’t enjoy every minute of eating my yummy salad full of almost-every-single-thing-that-I-love-in-the-world-foodwise (garlic, tomatoes, peppers, onions, olives, feta cheese…)…I mean really, what’s not to love about Greek salad? I made this Greek Grilled Chicken Salad the other night for a sweet friend of mine who gave birth to a precious baby boy a little over a week ago. I wanted to bring her a nice dinner salad, one that could be easily eaten at any time and one that filled you up. 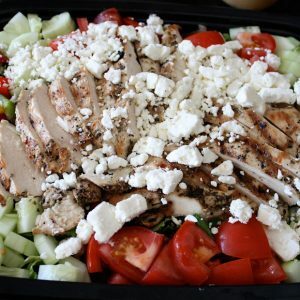 Greek salad with grilled chicken immediately came to my mind…and now after writing this I am almost wondering if there was a subconscious connection to the whole “new baby thing” … hmmm. Whatever the reason, I made one for my friend and I made one for us. 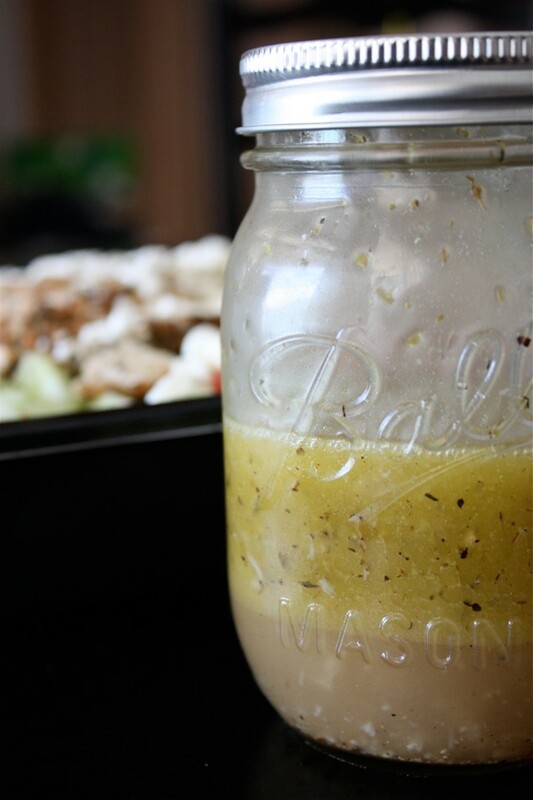 I started by making a good size batch of my homemade version of Greek dressing. I marinated some of the chicken breast in that same dressing before cooking on the grill. Lots of therapeutic chopping later…dinner. 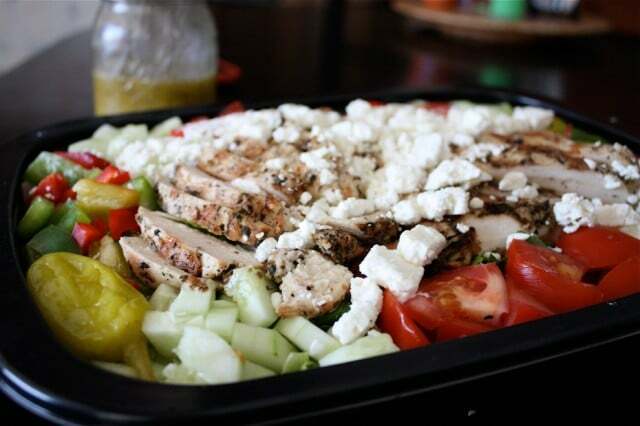 This Greek salad is so great or entertaining as well. It’s a type of salad that works well on a large platter versus a bowl. The ingredients look so pretty all lined up over the base of romaine. This is definitely an “eat with your eyes” kind of salad and always a crowd pleaser! Combine lemon juice, vinegar, oregano, thyme and salt and pepper in bowl. Using a whisk, slowly stream in olive oil and whisk into vinegar mixture. You will see it thicken up a bit (emulsifying) while combining. Store in a jar with a tight lid in the refrigerator after using. Always give the dressing jar a couple of shakes before serving. In my opinion, best at room temperature, so take it out a few minutes before using. Make it look as pretty or messy as you want to be. Layer it nicely on a plate for presentation or toss it all in a bowl and mix it up if that’s what you are in the mood for. PS…I’m also over at Reluctant Entertainer today featuring my super easy and fun Grilled Banana Boats! Go check it out! Sounds wicked good, the dressing looks like a souvlaki marinade I made once. Heh. Nice dressing! I love a good Greek salad. It sounds incredibly delicious Aggie!!! love the freshness in this dressing one of my fav’s always load up on the feta and olives this dressing will be awesome over this salad! Looks delicious Aggie! We have been eating salads for dinner for the last few weeks now – I will have to try this dressing out too! OMG that looks awesome! Gotta bookmark this one! I love Greek salads and I love having them with pizza. But there is no way I could pass up the ooey, gooey pepperoni pizza. You have will power of steel. But back to the salad….looks awesome and I’m going to give the dressing a try. I’m sure your friend really appreciated this dinner. YUM YUM YUM – this looks excellent! Love the dressing, gorgeous salad too! 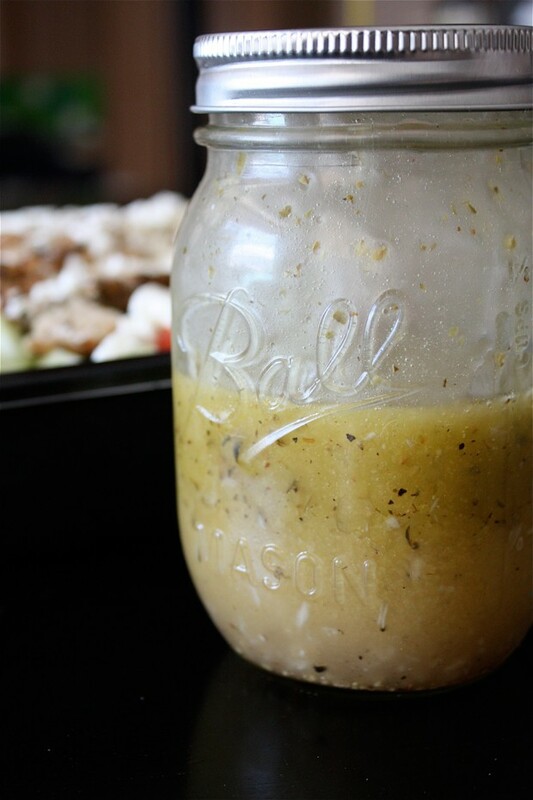 That dressing is awesome—oregano, thyme and lemon juice is a great combination…very light and healthy salad! So fresh for summer. And I love your photos! I’ve seriously lacked in homemade dressing creativity lately. I just put the same few ingredients together and call it done. I’m inspired now! Thank you! That is one seriously fabulous looking salad. And the dressing…yum! This is a delicious looking salad and such a sweet gesture for your friend! That is one delicious salad – oh my gosh! Yum! I’m going to have to try that dressing! Love that it can be used as a marinade for chicken… those are some of my favorite flavors! I need to make this! I have tons of feta right now. Looks so yummy! I made your recipe tonight for my family and we all absolutely loved it!!! All the flavors were amazing! Thanks so much for sharing! I’m addicted to Greek salads too – I think it’s because feta makes everything better! Yours looks perfect! Oh my gosh I LOOOVE Greek salads and Greek dressing. Bottled is just not the same. ive been physically and mentally addicted to chicken marinade salad for about a week now and its torn my life apart. My friendships, relationships and personal life are all ruined because of my addiction. If anyone else has this problem know that there are people out there like you. My husband and I constantly get into an argument over greek salads. I’m from Michigan and greek salads always come with BEETS! But, now that I’m living in KY, if I ever see greek salad on a menu its lacking beets.. I wonder if this is a regional thing?? I see you don’t have beets! Aggie…what seasonings do you use on your grilled chicken? This looks amazing! I have a greek salad on my site, but I use Tzatziki sauce as the dressing. I can’t wait to try this dressing!! Hi there! I just wanted to let you know I made this dressing recipe tonight for a Mediterranean dinner party and it was delicious! Thank you so much for sharing! Wonderful!! Thanks so much for stopping by and letting me know, so glad you enjoyed it! Hello from Finland! Your blog is amazing. I was wondering how long the dressing stays usable if stored in the fridge? I think homemade vinaigrettes like this usually are best used within 3 or 4 days. Hope you enjoy the recipe! I like a good Greek salad, and I’ve been enjoying the flavors at home with cucumbers and tomatoes from the farm share. I like to add marinated artichoke hearts to mine, primarily because I love them and buy them by the vat at Costco so they are always handy. Great photos of the dressing pre and post shake shake shake.